Here is my view – I guess that I’m anti PR on how social media will roll out. Anyway she nails it on the market. As we slide deeper and deeper into the recession social media is being cut left and right. Social media until it scales will continue to be cut. What’s the future for all social media strategists and practitioners – apply social media to the business processes on how to improve business results. The business process improvement aspect of social media – the impact to organizations in how they organize, talk to prospects, and customers. More importantly how companies compete.. words like ROI, finacial impact, leverage, revenue per employee, benchmarking, customer service, and business intelligence will trump words like engagement, conversations, storytelling, blogs, podcasting, viral branding. There have been a number of posts today about the role of PR. Some are saying that PR is dead. I don’t think so. I think PR is changing. What is changing is the process of PR. I mean the business process and the benefits of new strategies and tactics. For example from this blog I can effectively monitor and have conversations that impact others – opinion leaders, subject matter experts, and mainstream press. Hell why even hire a firm just sponsor a blogger. Some bloggers are better than PR firms because they cut through the cutter to talk directly with their audience. Getting access to that audience is key rather than the standard PR tactic to manipulate the audience. Just go direct. Audiences are smart so trying to do a head fake on them will only hurt the brand and reputation of the company. Bloggers offer a direct business model for PR firms. For instance, if a company in tech wants access they can just sponsor my blog ($5k a month) and I can (in most cases) do more than a PR firm can do for them. I’ve posted many times that what makes effective PR in the classic sense is becoming obsolete. The new PR is a combination of automated and algorithmic social media. There are many examples of this. PR Firms are traditionally hired to monitor and represent companies. Now companies and do that on their own or for alot less. However, high impact PR 2.0 is more than about pitching and buzz it’s about relating to the public – hence public relations. It’s about communications and collaboration. I’ve been following the Social Media Release story on Techmeme (the home of social media releases via blogs). This is my area and I have a big opinion. For the past 4 years I’ve been at the center of social media, social networks, social graphs,,bla bla bla. Social Media is the real deal. Here are some of my opinions that I’ve posted here before. Social Everything. Social Media New Standard for Online Advertising. Vertical Media New Online Advertising Model. Are Ad Agencies Dying? Matthew Ingram breaks this down for the average Joe and Mary – put freakin links in your releases. Thanks Matthew. Seriously Mr. Ingram is right on, and I’ll go on to say that SMNR are a good thing . Press releases have to change and are changing. Companies like Cisco and Intel are doing it right. Other leaders are moving in the social media direction as well. Two big problems with the above examples: 1) It’s just not about PR any more it’s about message distribution and rich media – hello integrated marketing and advertising groups – It’s not just PR anymore; 2) most of the examples mentioned above particularly Cisco are flawed in that their media isn’t social. Putting links in a release doesn’t make it social. Cisco is putting in links but the content is all about their walled garden site – that ain’t social that’s ‘jail’. 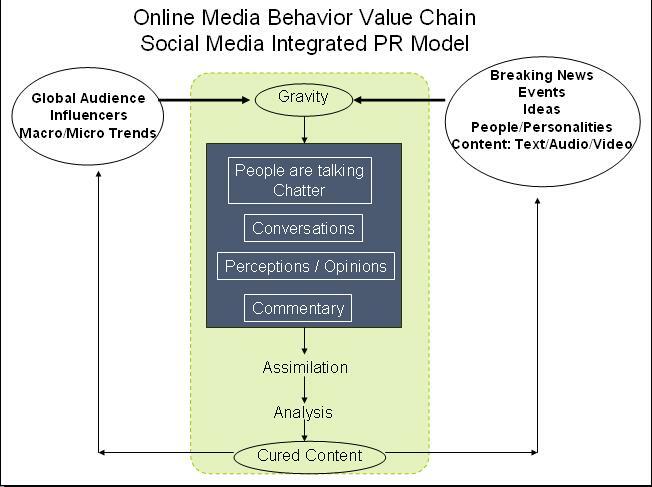 My Take: PR is now an integrated process that has it’s own value chain. It’s not about throwing a release out over the wall and it’s over. It’s a recursive process that requires resources both people and machines. This is where Tom Foremski is so brilliant. He has always talked about machine media working in tandem with people – thats social and that’s social media. My advice: produce media in the Social Media Release and make it social. Sometimes that will require resources (people and money). This has been the biggest issue for PR departments – they are underfunded for this activity yet it is becoming a critical success factor for their business. The lines between PR and online advertising is bluring. Thanks to Tom Foremski for starting this conversation. 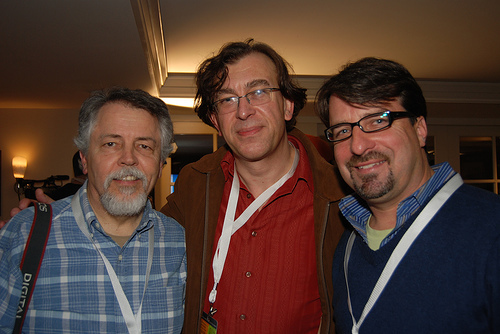 Here is a picture of me Tom and one of the fathers of blogging Doc Searls. Social Media Releases are the future of PR – now they just need to be social.